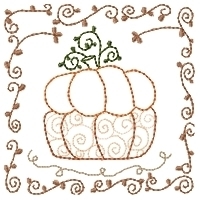 This beautiful fall sampler design will be perfect stitched on linens, wall hangings, door greeters, holiday tableware, quilts and much more. Fits the 4x4 hoop. This design is also available in a larger set! Just click on the "Pumpkin Patch Squares Set" icon above in the section entitled, "You Might Also Like..." for more information!